Taulun koko 30 x 20 cm. 10. You can trade old 44 for a new 22. 9. You can keep one gun at home and have another for when you`re on the road. 8. If you admire a friend`s gun anf tell him so, he will pobably let you try it out a few times. 7. Your primary gun dosen`t mind if you keep another gun for a packup. 6. Your gun will stay with you even if yourun out of ammo. 5. 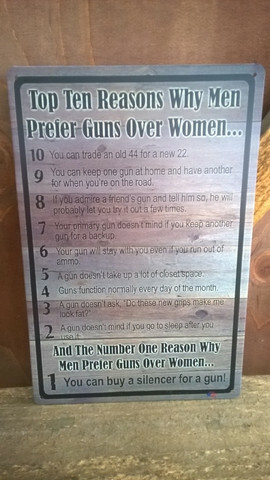 A gun dosen`t take up a lot of closet space. 4. Guns Function normally every day of the month. 2. A gun dosen`t mind if you go to sleep after you use it. 1. You can buy a silencer for a gun!